Virginia International University will put in place a No Contact Order at the request of any individual that is party to an incident of Prohibited Conduct, or when the university deems it to be necessary to provide for the safety and well-being of an individual, or to guarantee the continued access of educational opportunities. A No Contact Order is different than a Protective Order. A Protective Order is a civil court order meant to protect victims who have experienced physical violence, sexual assault, or stalking, or they have reasonable fear that they may experience physical violence, sexual assault, or stalking. A Protective Order is free. The university will provide assistance to any individual seeking a Protective Order, upon request. An individual may also seek assistance from the Fairfax County Police Department or from the City of Fairfax Police Department, or any other law enforcement agency that is appropriate. The information provided below is not legal advice and is specific to the state of Virginia. A Protective Order issued in one state is acknowledged and enforced in all other states and territories. If you would like to file a Protective Order in Maryland or the District of Columbia, the university can assist you in doing so. For more information about requesting a Protective Order in Maryland, click here1. For more information about requesting a Protective Order in the District of Columbia, click here2. An Emergency Protective Order (EPO) aims to protect the health and safety of any person regardless of a decision to arrest by law enforcement. A police office, or an individual, may request an EPO for any act involving violence, force, or threat that results in bodily injury or places one in reasonable apprehension of death, sexual assault, or bodily injury. Such acts include, but are not limited to, any forceful detention, stalking, domestic violence, or criminal sexual assault in violation of Virginia law. A petition or warrant for the arrest of the Respondent has been issued for a criminal offense resulting from the commission of an act of violence, force, or threat. Communication or other contact of any kind by the Respondent. An EPO remains in effect for 72 hours after it has been issued or the next day court is in session, whichever is later. The EPO will have the date and time that the order will expire. If an individual feels that they need protection for a longer period of time, they may ask the court for a Preliminary Protective Order. 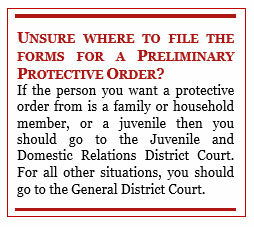 A Preliminary Protective Order (PPO) is issued by a judge or magistrate after an individual has filled out the necessary forms requesting a PPO. If the matter will be in the juvenile or domestic relations district court, the forms should be filed with the Court Services Unit. If the matter will be held in the general district court, the forms should be filed in the general district court clerk’s office. Once the forms have been filed, you may then go into the courtroom where the judge or magistrate may ask questions to decide whether to grant you a PPO. An individual must appear before a judge for a PPO to be granted. A PPO is valid for fifteen (15) days or until the date of the full hearing that is scheduled at the time the PPO is issued. A Full Protective Order (Protective Order or PO) is issued by a judge following the full hearing that was scheduled at the time the PPO was issued. The date of the full hearing will be written on the PPO. If you do not go to the full hearing, the PPO ends on the date of the scheduled full hearing. 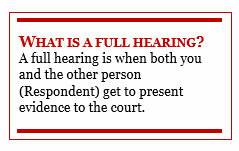 If you believe the other person is not going to attend the full hearing, you should attend anyway and ask the court for a PO. A PO takes effect when the other person is “personally served” and is valid for any period of time up to a maximum of two years. If you are granted a PO it is important that you keep a copy of it with you at all times. If the Respondent violates the order, show the PO to a police officer, magistrate, prosecutor, or judge. VIU will honor and enforce all Protective Orders from Virginia, other states, and territories of the United States. If you have a Protective Order, please inform VIU as soon as possible. It is only possible for VIU to honor Protective Orders if the university is made aware of them. To inform VIU of any Protective Order (EPO, PPO, PO), email titleix@viu.edu. For more information, click here3. This information is provided as general information and is not legal advice. 3. Virginia Court System – District Court Protective Information Sheet. http://www.courts.state.va.us/forms/district/info_sheet_protective_order_stalking.pdf.